The Ralph C. Wilson Jr. Foundation has awarded a $2.8 million grant to the Buffalo Urban Development Corp. to help the city's nonprofit economic development agency with ongoing waterfront planning and development in downtown Buffalo. The award represents another boost for Buffalo's economic development and revitalization initiatives, which have already seen significant new activity at Canalside and the Outer Harbor, but not as much elsewhere. 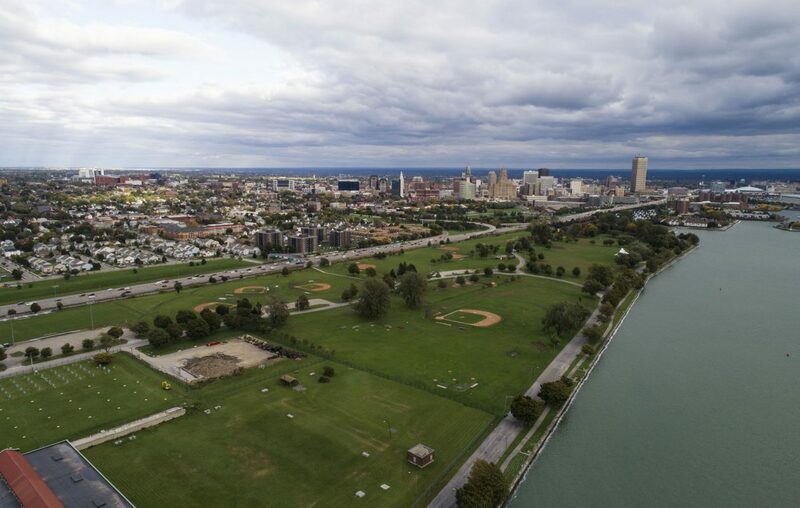 It comes in the wake of the foundation's $50 million gift last October to transform LaSalle Park into the Ralph C. Wilson Jr. Centennial Park. That included $40 million for the park and $10 million for the maintenance. It's likely to encourage even more change going forward. "This is a very, very significant grant," said Buffalo Mayor Byron W. Brown. "We are already getting inquiries from other entities that want to move projects forward on the waterfront or near the waterfront, so this is a very timely investment by the Wilson Foundation." Brown cited about $500 million in public and private development projects under construction or planning along the waterfront, between Porter and Michigan avenues, as well as the potential for a new convention center or Buffalo Bills stadium. "It shows that the Wilson Foundation does have great confidence in the city of Buffalo, in the Buffalo Urban Development Corp.," Brown said. "We have worked extremely closely with Wilson and I think through the close working relationship that we have, they see the work that is going on in the city of Buffalo, they see the progress that is being made, and they look for strategic ways that they can assist us in moving projects forward." He also said that he and Brendan Mehaffy, executive director of strategic planning, had "a very exciting meeting" recently with another unidentified entity "that wants to make a multimillion-dollar investment near where all this work is taking place." “There is an unprecedented amount of development activity along downtown Buffalo’s waterfront," said BUDC Executive Vice President David Stebbins. It also puts BUDC front and center in the effort to reimagine the city's urban waterfront, expanding its mission significantly. BUDC has traditionally worked to reclaim former industrial manufacturing sites as vibrant new commercial hubs, turning them into shovel-ready land or redeveloping buildings for reuse. Among its past projects were the RiverBend site that is now occupied by the Tesla plant, as well as the Buffalo Lakeside Commerce Park and the Northland Corridor. More recently, it's also become engaged with downtown infrastructure initiatives and other activities, such as the Queen City Pop-Up and the Buffalo Building Reuse Project. But its new waterfront work takes it to a new level of involvement in the city. "BUDC has demonstrated tremendous effectiveness and great capacity to do economic development work," Brown said. "BUDC is certainly a proven commodity. It is an economic development arm of the city of Buffalo, and the city and other organizations at the local, state, federal and private-sector levels have great confidence in the work that BUDC does." "There is an extensive visioning process going on now for LaSalle Park. The process we're engaged in with Wilson will transform the city and its waterfront for generations," Brown said. "This is another important step in that process, which will enable us to manage that funds that are coming in better, to make decisions about the funds, and to work to generate additional funds." BUDC will oversee the park project from preliminary and schematic design to construction, and will also coordinate with federal and state agencies that have jurisdiction over elements of the waterfront. Part of the work also entails connecting Centennial to the rest of the city via trails and roads, because "that park is really kind of isolated," Stebbins said. "This money is to help us manage that. "Forty million dollars sounds like a lot of money, but there’s a lot of needs there when you start talking about bridges and the seawall. If there are other projects, we have to find other funding sources to pay for those additional projects. They want Centennial Park and everything it means for the city to be a success." The grant was announced Tuesday during the agency's monthly board meeting, when directors formally voted to accept the money and the responsibility. “Our founder Ralph C. Wilson Jr. provided the foundation with a tremendous opportunity to make an impact in the quality of life for the people of Buffalo and Western New York," said J.J. Tighe, director of the foundation’s Parks and Trails Initiative. "As we make substantial investments in the region, such as the reimagining of LaSalle Park, we felt it was important to also support the related capacity needs in the park’s development as well as address some of the immediate needs in the park that have surfaced during community meetings while the design is evolving over the next few years." Officials were quick to praise the Wilson Foundation not only for the gift, but also for the collaboration with the city. "I’m very happy that Mr. Wilson decided to choose Buffalo and Detroit," said Common Council President Darius Pridgen. "It is refreshing to see someone working to bring money to the city, but also working so closely with the city." "This is very exciting, the generosity of the Wilson Foundation," said Deputy County Executive Maria Whyte. "The consistent, ongoing operational support is obviously a great deal to the city."